Are you trying to figure out what you can do to make a difference in your financial health? Blackhawk Bank offers a complete set of financial planning calculators for this exact reason. By answering a few simple questions, you can get concrete steps to reach virtually any kind of personal finance goal. These tools will get you on the road to the outcome you want. Whether you’re planning to make a big purchase or just wondering how much to keep in your savings account, our simple and effective tools are sure to come in handy. Some of our most popular calculators are described below. Compound interest has been called one of the most powerful forces in the world of finance. With the Compound Interest Calculator, you’ll see how “interest on your interest” adds up based on how often compounding occurs. For millions, college is the most important investment of all. Our College Savings Calculator goes beyond the basics to help you construct a complete college savings plan. It includes factors like education cost, inflation and tuition to help you get clear answers. A certificate of deposit is a compelling and safe investment option that offers FDIC insurance. Attractive fixed interest rates and terms make the CD a reliable choice. It only takes four simple questions to get a complete picture of your CD’s potential for growth over time. A CD ladder is an investment strategy that includes investing in a series of Certificates of Deposit that feature different dates of maturity, giving you greater liquidity of your investment funds should you need them. You can calculate the potential advantages of laddering with this easy-to-use tool. Want a monthly savings calculator you can easily understand and act on? This will tell you exactly how to reduce your spending by exposing potential savings in entertainment, budget and utilities. It’s time to reach your savings goals! If you need a simple savings calculator for long-term planning, you need the Accumulate Savings Calculator. This tool focuses on the benefits you can achieve if you make consistent deposits into a savings account, even if they are smaller ones. Adjust the settings and see growth over time! Who hasn’t dreamed of having a million dollars? For many people, it just may be attainable – but it takes planning and financial diligence. The Save a Million Calculator will help you chart the course to that all-important number based on your age, saving habits and expected retirement age. Want to plan out your savings in an easy, intuitive way? This savings goals calculator gives you the complete spectrum of savings inputs and generates a graphical representation of how long it will take to reach your goal. Once you get this information, all you need to do is put funds in an appropriate account each month. It’s essential to make sure you have a plan in place for the unexpected. An accident, sudden healthcare bill or vehicle breakdown can turn into a major challenge. The Emergency Fund Calculator makes it easy for you to navigate life’s ups and downs. One of the fastest ways to save more money is by honing in on important daily expenses – especially lunch! The Lunch Savings Calculator is a fun way to compare the cost of dining out with the bagged lunch you could bring from home. The savings are almost always worth it. Taxes and inflation are both important pressures that any good financial plan should account for. Unfortunately, they are also easy to overlook on a day-to-day basis. This Taxes and Inflation Calculator will help you determine your savings yield when taxes and inflation are included. Blackhawk Bank is known for combining world-class financial expertise with friendly, approachable professionalism. No question is too big or too small for our personal bankers to help you with. Our savings calculators are a great start for planning the next step in your financial journey. Sometimes, however, it’s best to get an expert perspective. Visit one of our Blackhawk Bank locations or simply contact us today and benefit from our years of experience working with individuals, families, small business owners and large enterprises. No matter what your needs or goals look like, we have the insight you need to choose the right financial products and structure a savings or investment plan attuned to you. 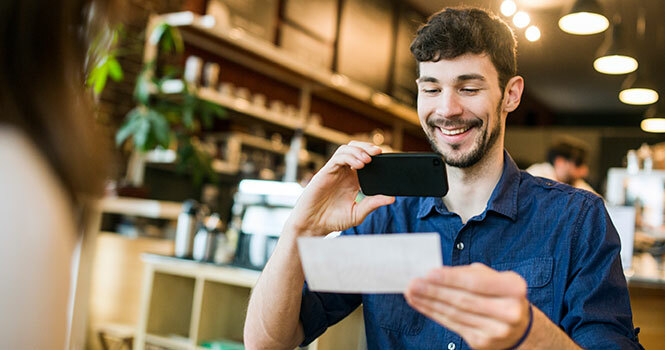 Deposit your checks from your tablet or phone, anywhere and everywhere! We offer a wide selection of Credit Cards for your everyday use.